Orlando, FL — Fifty people have been killed and 53 injured in a tragic Orlando nightclub shooting that occurred early Sunday morning. The shooting is the deadliest in recent US history and the worst attack on US soil since 9/11. As new information comes to light, we are finding that the shooter has a rather suspicious and unusual past. This morning, it was announced that the shooter was identified as Omar S. Mateen, a US born citizen whose parents were from Afghanistan. After his identity had been revealed, a slew of other information began rolling in, including photos of him wearing multiple NYPD apparel items. 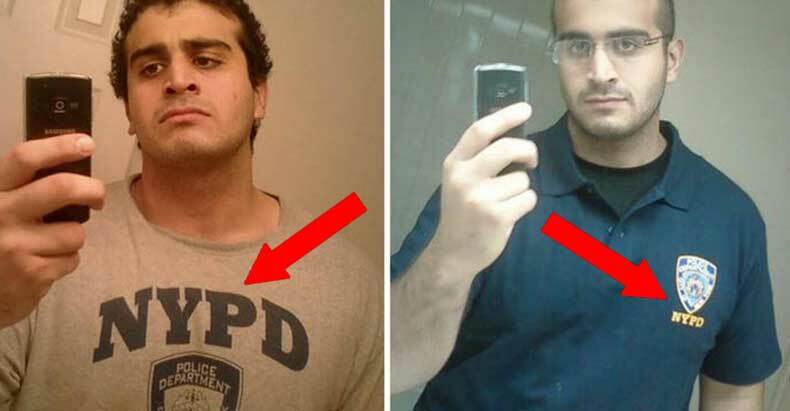 The NYPD quickly noted that Mateen has no association with the department, and that the shirts he was photographed in were unofficial garments that could be purchased at any store. Adding to the suspicious nature of an alleged sociopath shooter taking selfies wearing NYPD shirts, a search of the Florida Department of Agriculture and Consumer Services database reveals that Mateen had security officer and firearms licenses as well. So, not only was this man an apparent fan of the NYPD, but he was also taking actions to becoming a law enforcement officer himself. On Sunday afternoon, the NY Post reported that Mateen pledged his obedience to ISIS before he carried out the attacks in a 9-1-1 call to local authorities. On the contrary, just before the news of the 9-1-1 call, NBC talked to Mir Seddique, the Afghan immigrant father of Mateen, who says it is intolerance of homosexuality, and not affiliations with radical Islam, that likely provoked the attack. As if the shooter’s obsession with law enforcement wasn’t odd enough, mainstream media reported that police have been watching him over the last five years, but noted that he was not on a terror watchlist. On top of all the information on the suspected shooter, at least one witness was recorded on video describing multiple shooters at the night club. As the information continues to pour in about this tragic shooting, one thing is certain — it will be used by the establishment as a means to expand the police state. We will continue to update this article as more details arise.